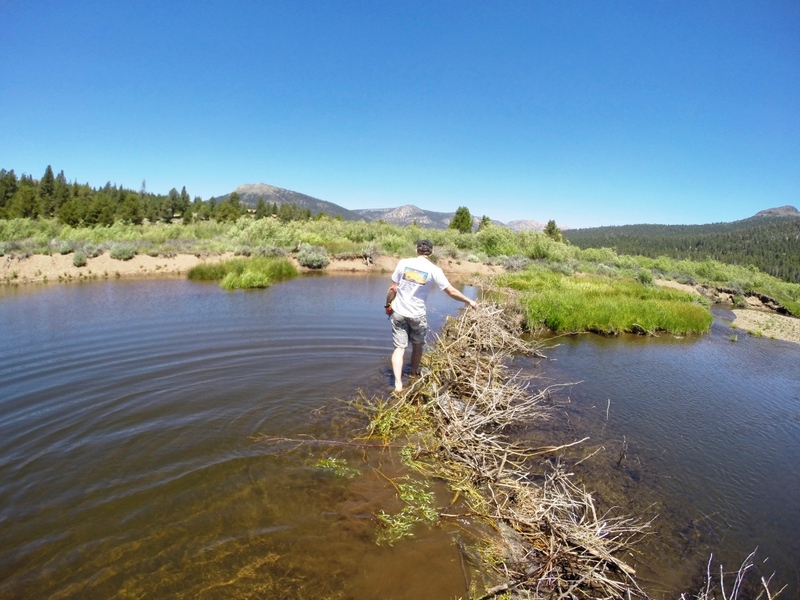 Meanwhile, my partner takes measurements at the two beaver dams spanning the river. Combined dam length? 132.2 feet. Dam height? 2.2 feet. Fish present? Yes, abundantly. Beavers are well known for building dams and ponds, but many people don’t realize how much they benefit the landscape and our own quality of life. Beaver ponds slow water and give it a chance to sink into the ground, where it can recharge aquifers and provide base flow for streams and rivers during dry periods, improving our access to water when we need it most. Those pools also make excellent habitat for aquatic bugs, fish, and numerous other species. The ponds flood during higher flows and spread water further, increasing wetland area and letting even more water sink in. Larger wetlands means more habitat for plants like willow and aspen, which in turn make more habitat for many bird species, including the threatened willow flycatcher. Perhaps best of all, the dams catch sediment as it travels downstream. Much of our work in restoring meadows centers on reversing erosion in stream channels. Beaver dams can rebuild an eroded stream channel with new sediment and transform it into a healthy meadow again over time. In other words, beavers do our meadow restoration work for us, for free. The North Pacific Landscape Conservation Cooperative just released a comprehensive beaver restoration guidebook, written by scientists from the US Fish and Wildlife Service, NOAA, the US Forest Service, and Portland State University. Some people raise concerns that dams block fish and other species from moving up and down rivers. Fortunately, beaver dams don’t function like a concrete or earthen dam, and tend to benefit fish more than harm them. Beaver dams are porous, allowing smaller fish to squeeze through, and they create side channels or overflow easily in high water, allowing larger species like coho salmon to pass most of the time. Despite all the benefits beavers and their dams have on wetlands and streams, beavers have had a rough time in California. Before the California gold rush, a wave of European fur trappers with the British-owned Hudson Bay Company swept through the Sierra Nevada beginning in 1821, intent on denuding the land of all furbearing mammals so that the Americans would have “no inducement to proceed hither.” They were so successful in trapping out beaver in the region that 115 years later Joseph Grinnell, a preeminent California zoologist, mistakenly considered the large rodents to not be native above 1000 feet in the Sierra Nevada. Since then, land managers and government agencies in the region have typically classified them as a nuisance species at best and even sometimes as a full on invasive species. 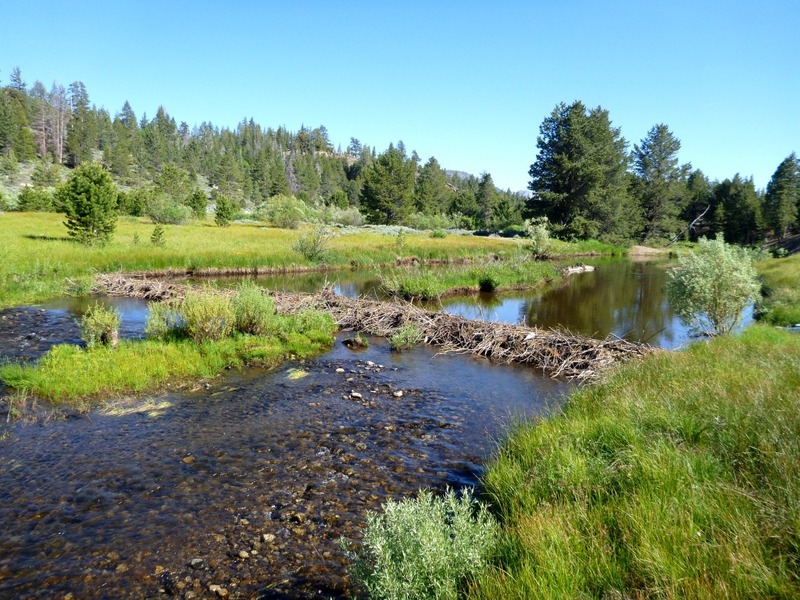 Recent evidence for beavers in the Sierra Nevada, including a buried beaver dam carbon-dated the year 580 AD (±60 years) and a review of historical records, make it clear that the animals did inhabit much of the mountain range before the fur rush. Unfortunately, policy and public opinion are slow to adapt to the new information. California Fish and Game Commission doesn’t set any limits on the number of beaver that can be trapped in the majority of the state and it is illegal to relocate nuisance beavers in California. Many people still resent the animals and go out of their way to remove them. Continuing down the river, we come to a four foot high dam–with a fresh gaping hole torn through the middle of its forty foot length. Fish still take refuge in the shade of the dam, and it still holds back some of the sediment flowing downstream, but it’s easy to see where the water recently swelled past the river banks and far onto the meadows on either side. The pool, the active wetlands, and the sustained summer flows on the river all washed downstream when someone breached that dam. It’s true that beavers, with their engineering prowess, can cause serious problems for people. They plug culverts, flood fields, roads, and houses next to streams, and cut down favorite trees. The thing is, humans are excellent engineers too, and with all the ways that beavers benefit us and our environment, we have better ways to deal with them than extermination. Simple measures can protect culverts and individual trees, and devices can control the level of beaver ponds to prevent flooding. As long as we can outsmart them, we can reap the benefits of beavers and their engineering without damage to our own constructions. Finishing our survey, we come across many more dam remnants from years past and one more active beaver pond. As we work to restore the ecological function of this meadow, and many others, it’s important to remember that we’re not alone. Beavers might not care about improving the quality of life for people downstream, but they restore meadows like their lives depend on it, anyway.